For those of you who follow Bytes & Belief on Twitter (@bytesandbelief), you may remember that I recently had a chance to visit the legendary TWIT Studios for a live recording of the This Week in Tech podcast. 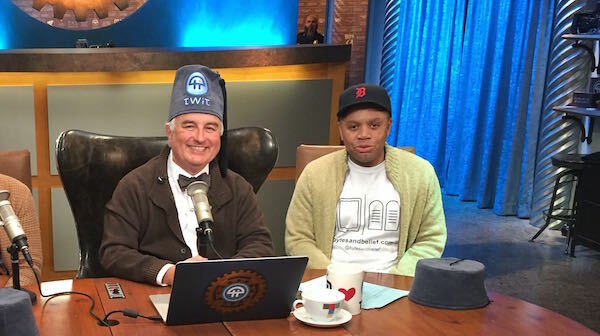 The TWiT network, founded ten years ago buy Leo Laporte, has been a pioneer in the world of internet-based radio shows, better known as podcasts. Thanks to my keen scheduling skills, I arrived at the studio too late to see the actual show. Leo was gracious enough to sit and talk with my wife and I for a few minutes about Bytes and Belief, as well as take a few pictures. So even though I missed the show, I had a wonderful time! Thanks again to Leo and all the great people at TWIT!!! Posted on May 4, 2015 by bbblggr. This entry was posted in Uncategorized. Bookmark the permalink. ← Are ‘Bots People Too?